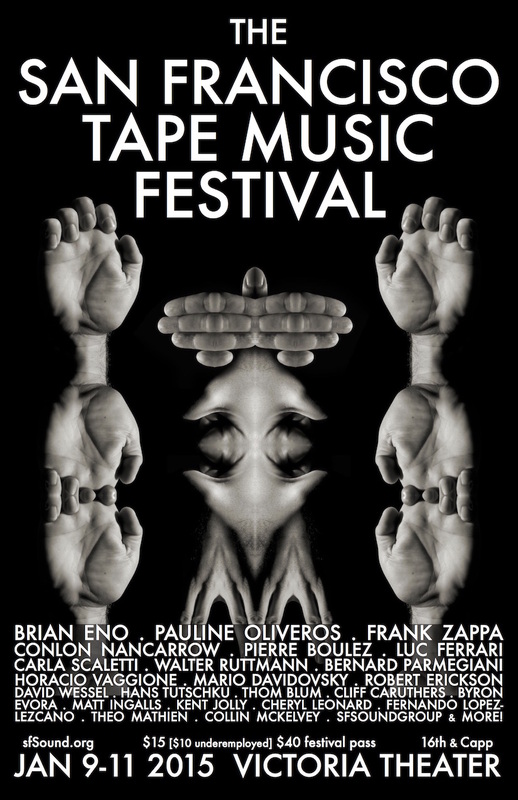 America's only festival devoted to the performance of audio works projected in three-dimensional space, The San Francisco Tape Music Festival features four distinct concerts of classic audio art and new fixed media compositions by 32 local and international composers. Hear members of the SF Tape Music Collective, along with guest composers, shape the sound live over a pristine surround system (24 high-end loudspeakers) with the audience seated in complete darkness. It's a unique opportunity to experience music forming - literally - around you. The 2015 Festival features two concerts showcasing the entire range of the “fixed media” artform; a Saturday late-night concert of longer, psychedelic, and ambient tape pieces (including the premiere of the 17-minute, 16-channel "full" version of BRIAN ENO'S Golden); and a concert featuring SFSOUNDGROUP performing works for instruments and electronics by some of the greatest French and American electroacoustic composers. ...a cinematic “radio play”, sine wave synthesis, a collage of recordings made on optical film in the 1920's, Brownian motion sonification, oscillating filter bank drones, and manipulated bandoneón music. We perform a rare work by CONLON NANCARROW and an optical film piece by WALTER RUTTMANN that predates "tape music" by decades. We also premiere a new work by Stanford professor FERNANDO LOPEZ-LEZCANO and perform numerous recent works by international composers including the San Francisco based THEO MATHIEN. We also feature a tribute performance of Antony by UC Berkeley professor DAVID WESSEL, who unexpectedly passed away in October. ...field recordings, cinema for the ear, sound-design works, processed gamelan, samples of Tejano and synth-pop music, and a FRANK ZAPPA classic. We also present numerous recent works by international composers and locals BYRON EVORA, KENT JOLLY, and CHERYL LEONARD. In addition, Bay Area composer COLLIN MCKELVEY and San Francisco Tape Music Collective's own THOM BLUM premiere new works. This concert features a premiere by BRIAN ENO. In 2007, Eno composed Golden, a new 16-channel work specifically for our festival. He created multiple versions of various lengths, and the "full" 17-minute version will have its public debut on this program. In addition, we present a rare performance of PAULINE OLIVEROS'S The Day I Disconnected the Erase Head and Forgot to Reconnect It - one of her classic analog synth tape pieces from 1966 that predates the Bay Area Noise scene by decades. The program also includes a new work by Dutch composer AUGUSTO MEIJER and a sonic landscape composition by San Francisco Tape Music Collective's own CLIFF CARUTHERS. Our final concert features the Festival's first collaboration with instrumentalists in a double-program exploring the various relationships between electronic and acoustic sounds. Performed by SFSOUNDGROUP, the first half features a program of music by French master composers PIERRE BOULEZ (violin and live electronics), LUC FERRARI (improvising ensemble and tape), and two tape-only works that are comprised of manipulated instrumental sounds by acousmatic icons BERNARD PARMEGIANI, and HORACIO VAGGIONE. The second half features a program by American composers MARIO DAVIDOVSKY (ensemble and tape), ROBERT ERICKSON (ensemble and tape), HANS TUTSCHKU (oboe, bass clarinet, and iPads), and MATT INGALLS (clarinet and tape).